Ethnography and qualitative research methodology in general have witnessed a staggering proliferation of styles and genres over the last three decades. Modes and channels of communication have similarly expanded and diversified. Now ethnographers have the opportunity to disseminate their work not only through traditional writing but also through aural, visual, performative, hypertext, and many diverse and creative multimodal documentation strategies. Yet, many ethnographers still feel insufficiently proficient with these new literacies and opportunities for knowledge mobilization, and they therefore still limit themselves to traditional modes of communication in spite of their desire for innovation. As university-based, community-driven and politically mandated agendas for broader knowledge transfer keep increasing worldwide, the demand for public scholarship continues to grow. Arguing for the need to disseminate innovative ethnographic knowledge more widely and more effectively, this book outlines practical strategies and tools for sharing ethnographic and qualitative research through widely accessible media such as magazines, trade books, blogs, newspapers, video, radio, and social media. Drawing from practical experiences and hands-on lessons, Doing Public Ethnography provides social scientists across all disciplines with concrete tactics for mobilizing knowledge beyond the academic realm. 2. 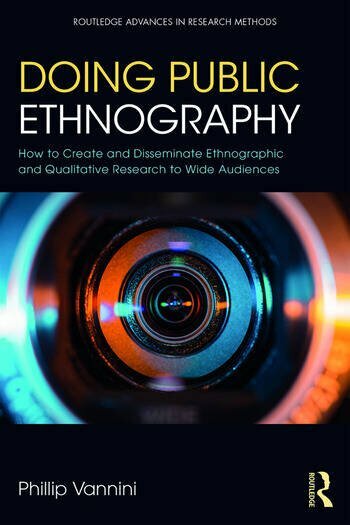 What is public ethnography and whom is it good for? Phillip Vannini is Professor and Canada Research Chair in Innovative Learning and Public Ethnography at Royal Roads University, Canada.